Meet The Amazing Ensemble Inside of YOU! In every body, there resides an amazing ensemble that contributes to playing ease, comfort and expression. 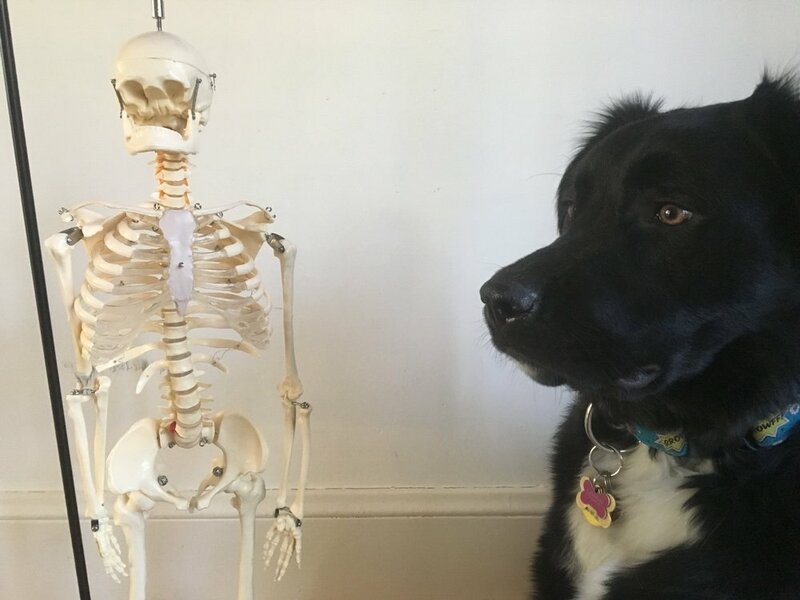 This is not a musical ensemble, but an ensemble comprised of bones and discs. You know it as the your spine. Support, movement and protection are just some of the functions of this ensemble. Understanding its design and movement potential will change the way your perform. In this post, I will guide to you identify key places of the spine in your body, which in turn, will help you move better, because Movement Matters for musicians. The ensemble: 24 vertebrae, 23 discs, sacrum and coccyx. Length: the spine is almost half your height! It spans the distance from the base of the skull (right behind the earlobe) to the level of the hip joints. The two internal curves, curve 1/2 the depth of the body front to back, (in most bodies). Around the front and sides of external curve in the upper back are the lungs, breathing space. Notice the difference in shape and bone mass between the front & the back. On the back notice the bony processes, not designed for support. These can be felt just under the surface of the skin, easily found on the back of the neck. On the front, notice the how large this part of the vertebra is. 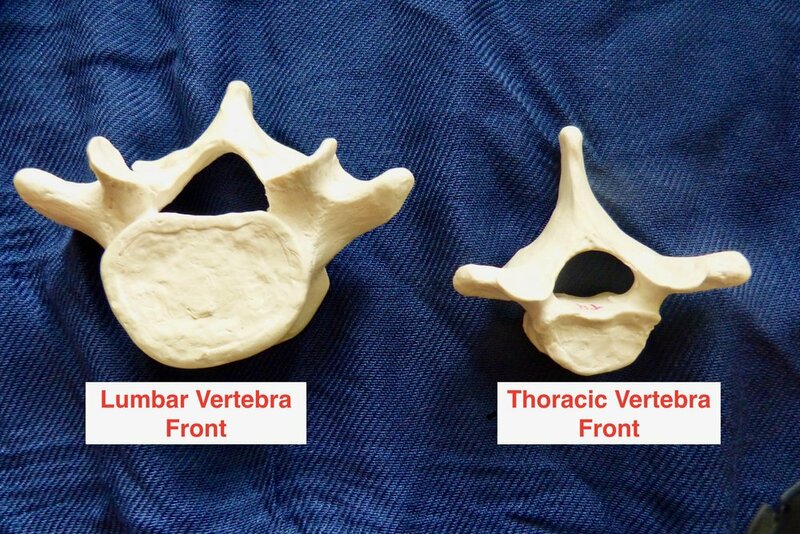 This portion of the vertebra is designed for support. You can’t touch this portion but knowing that it is there and what it is for will refine your movement. Use your hands to locate the top and the bottom. Notice just how long your spine is. It is almost half of your height. Move around and imagine how this long ensemble of bones and discs supports and contributes to the movements. Identify how deep the spine is in your body. Stand sideways to the mirror and imagine the internal and external curves. The internal curves fill 1/2 the depth of from back to front. Use your hands to help you locate key landmarks of the spine. Point a finger in at the base of the skull, right behind your earlobes. In this location, the shape of the bones curve this deep! 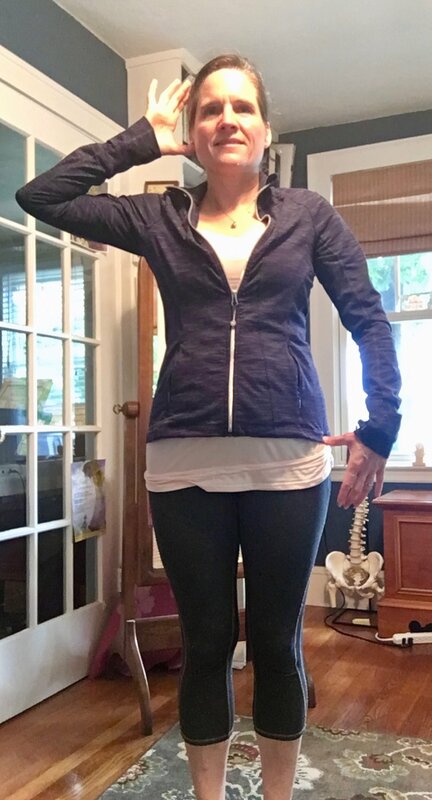 Find the other internal curve in the lumbar region by pointing in on the seam of your shirt/pants by resting your thumbs on the top of the pelvis. Run the side of a hand a few inches along the seam of your shirt and pants, right at the top of your pelvic bones. If you could extend your hand into the body you will touch the front of the lumbar spine here. Take a walk around and sense your spine and how it responds to the walking movements. Lie on the ground with knees bent. Gently tuck and untuck your tailbone. Notice how this movement resonates through the entire length of the spine, your head is probably nodding gently. Mapping the spine is one of my favorite things to teach in my Body Mapping courses. For many musicians it is a game changer. This ensemble is beautifully designed to help you be upright, support your head and instrument, and allow movement in endless combinations. All things we need as performers. The more connection you have with your spine, the more movement nuance you have access to, which spills over into your playing unleashing your artistry. This week, check in on your spine as you move through your day. Copying the picture of the spine into your photos or printing it out is fantastic reminder for you. Also move it! You can perform the same tucking and untucking of the tailbone as you sit at your desk or ride in the car. Here is a little spinal movement inspiration from you!